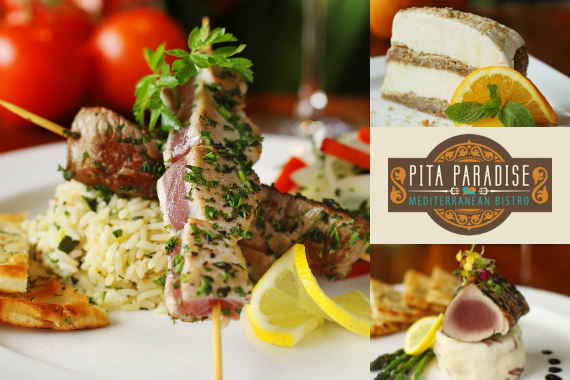 Pita Paradise is a Greek and Italian restaurant in the Kihei Kalama Village and Wailea Gateway Center. Enjoy fresh fish caught daily. "We'd like to believe you come to our place just to see us, but we know what you’re really here for." "The Easter Bunny wanted us to remind you that a delicious meal is just a hop, skip, and a jump away!" "Friends tell friends about good food. https://www.yelp.com/biz/pita-paradise-wailea"
"Make your next dining experience one to remember." "No words are needed, but here's one: yum." Stopped by for a quick lunch and thoroughly enjoyed the teriyaki chicken pita sandwich. The sauce was perfectly sweet without being sugary and complemented perfectly by the Mediterranean coleslaw and truffle rice pilaf. Good lunch spot try the CCP with cheesy bread. Yes, I'd like to receive news from Pita Paradise. Sign up for the Pita Paradise Newsletter!